Ah, there is nothing quite like a birthday cake! Although I’m not baking often, I love these special occasions to try out recipes, I have been holding on to for such moments. Maybe to fight off the signs of ageing, I got a powerful and exclusive dose of antioxidants: Japanese matcha powder. And what could be a better idea to start my rejuvenation by incorporating it into my birthday cake? Special guests deserve a special cake. Oh, and in case you wondered: it was unbelievably delicious. Creamy, super light and yet with a wonderful crunch. The perfect cake for birthday party in the spring. 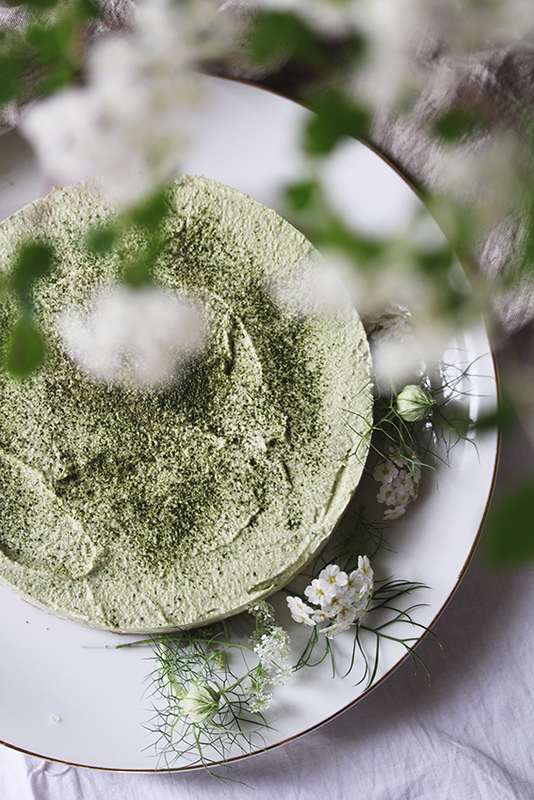 So what makes matcha such a ‘thing’ – besides its colour, which obviously inspires people to create all sorts of recipes with it? Before telling you about its true superfood qualities: matcha has a unique taste, that I’m absolutely in love with, but find it hard to describe. It’s light, delicate, citrusy without acidity, some call it grassy. Matcha powder are carefully stone-grounded Japanese green tea leaves. So when drinking matcha you don’t just steep the tea leaves, but consume the whole leaves, which gives you a much more powerful dose of the green tea’s nutrients. What makes matcha so exclusive and gives it its vibrant green colour is the fact that the plants become shaded prior to being hand-picked. This enhances their chlorophyll and amino acid content. It is the amino acid L-theanin, which lends matcha its special qualities. Matcha does contain caffein, but thanks to the L-theanin it promotes sustained concentration without leaving you with the jittery feeling that often comes with coffee. A powder that thanks to its high antioxidant content helps to protect you from free radicals, increases the metabolism, gives you energy and calmness at the same time – this sounds like true magic to me! Whisking up a cup of matcha is a ritual I enjoy, but when your new to it, don’t let yourself be intimidated by the equipment. The froth might not be as perfect, but any whisk and wide cup or little bowl will do. Just remember – like with normal green tea – to never use boiling water. 80°C is perfect. And I definitely recommend to experiment with a almond or coconut milk matcha lattes – so good! 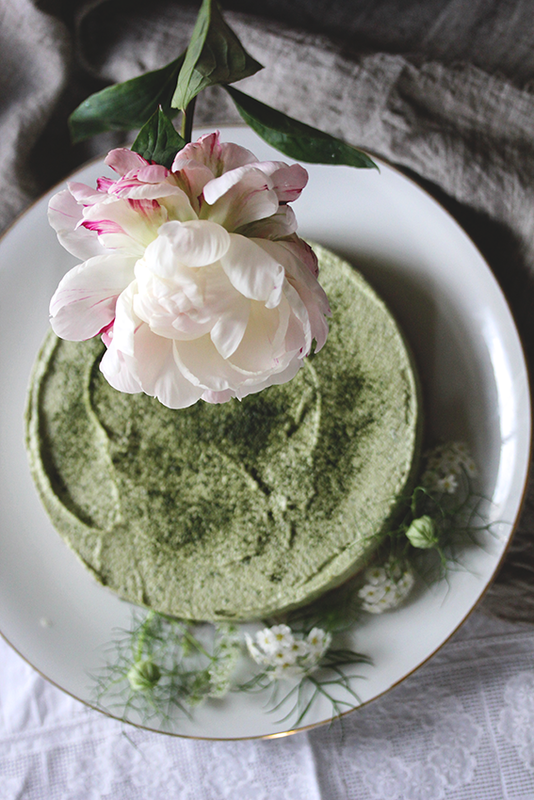 There is a wide range of different qualities of matcha powder to be found. For this recipe a ‘cooking grade’ matcha will possibly be fine. However, I recommend to go for a mid-range quality, because you surely want to drink your matcha with all its superfood properties and don’t just want it to use in baking. All you have to do is to buy a regular can of coconut milk (just make sure, it does not contain any additives that stop the coconut cream and water from separating or other nasty stuff like preservatives). I usually buy one with 65% coconut cream (don’t use ‘light’ coconut cream – in fact, never use any ‘light’ products). Place the can in the fridge overnight to make sure the cream separates from the water (this won’t be necessary in the European winter months). Open the can and pour out the water (or scoop out the cream, whichever happens to be at the top). Don’t discard the water, use it in smoothies or soups. You can whip up the cream with a hand mixer just like cow’s milk cream. It’s mildly sweet and delicious with a sprinkle of cinnamon or some berries. A note on consuming nuts: I wrote about the importance of soaking grains and legumes before – the same applies to nuts and seeds. They should be soaked, sprouted or roasted, because they contain enzyme inhibitors, which make them though to digest (read more about this here). Therefore I recommend to ‘activate’ all your nuts. ‘Activating’ them means to overcome these inhibitors, preferably by soaking them overnight in lightly salted water and then slowly ‘drying’ them in the oven at a very low temperature (or with a dehydrated, if you happen to own one). While I avoid to consume raw nuts, I have to admit, that I am often using a shortcut, which is not as effective, but still a good choice and also makes the nuts so much tastier. I simply roast the nuts in a pan, which brings out their ‘nutty’ flavour even more. Just make sure, you don’t burn them – this would ruin all your effort to make them even healthier. If you want all ingredients to be absolutely raw, you can skip this step – the cake recipe will still work out fine. Start the night before, or at least two hours prior to making the cake, by soaking the cashews in water. You also might want to place the can of coconut milk in the fridge for making the whipped coconut cream (see note above). On the next day, line the bottom of a 20cm springform tin with baking paper. Place the almonds (either raw or activated) in a food processor and process them until you’re left with small chunky crumbs. Melt the coconut oil and lightly roast the shredded coconut in a pan (be careful, it burns easily! Again, you can skip that step for a completely raw cake). Combine almond crumbs with the rest of the ingredients. The mixture will not completely stick together, but don’t worry: Press it with your hands very firmly into the base of the tin and then place it for at least half an hour in the freezer to set. To make the filling, whip up the coconut cream and place it in the fridge. Drain and rinse the cashews and place them together with all the other ingredients, except the coconut cream, in a high-speed blender or food processor. I had to use my food processor, but if your blender is powerful enough, I think this is the better option. It may take some time, but in the end you will be left with a delicious cream. Fold in the whipped coconut cream with a spatula or wooden spoon. Pour the mixture evenly over the base in the tin and place it in the freezer until solid (for about one hour). Take it out 30 minutes prior to serving – it will become super creamy without losing its shape. 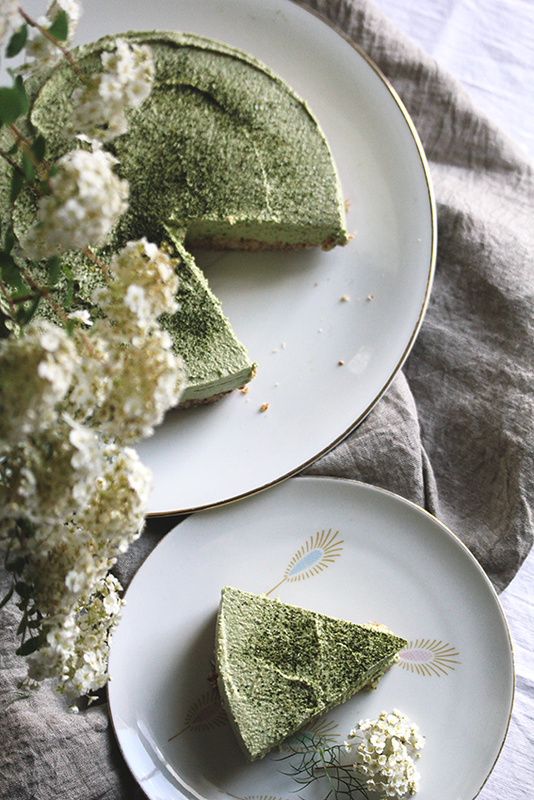 Right before you serve it, sift a little matcha powder on top.